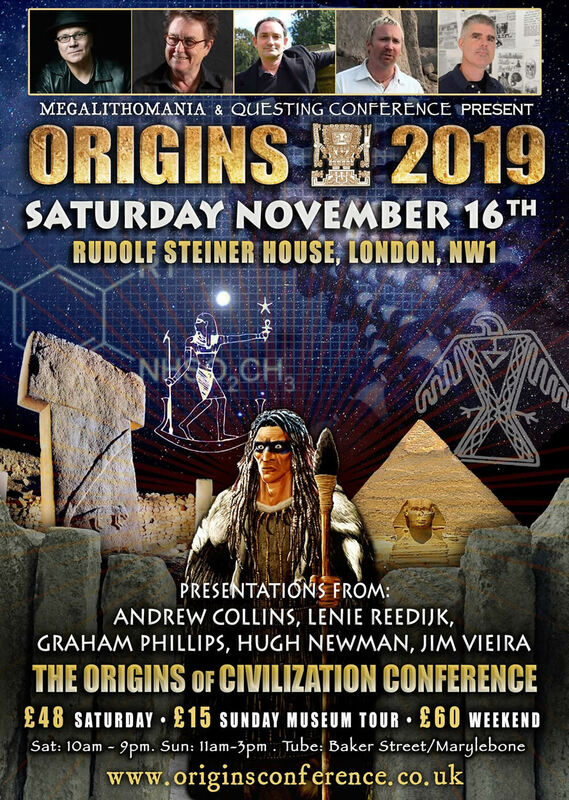 The Origins Conference was founded by authors Andrew Collins (Questing Conference) and Hugh Newman (Megalithomania) in 2013 to explore the origins of civilization. The 2019 conference takes place at Steiner House in London on Saturday 16th November with a Sunday visit to the British Museum. Listen to lectures, news and revelations, and share views and ideas with others on the quest of discovery. We welcome back Graham Phillips who will be presenting research from his new book 'The Wisdomkeepers of Stonehenge' and Jim Vieira from America who will be sharing evidence of esoteric teachings in prehistoric cultures. Andrew Collins will reveal brand new research on the origins of the Denisovans, and Hugh Newman will be looking at ancient Wales and the profound stories of giant cultures and their connection to megalith building. We welcome special guest Lenie Reedijk from Holland who's groundbreaking book 'Sirius: The Star of the Maltese Temples' has caused a sensation, and more special guest speakers will be announced soon. There will be a Sunday visit to the British Museum to explore some of the most famous exhibits including the Rosetta Stone, Assyrian hall, Egyptian hall, Sumerian hall, Mexican room, and more with Caroline Wise. Early bird ticket £48 (first fifty tickets sold only, thereafter £52 per ticket). Optional Sunday Museum Tour is £15. Early bird combined Saturday and Sunday ticket £60 (first fifty tickets sold only, thereafter £65 per ticket). All tickets include a £2.50 booking fee.